We can never deny the fact that some of us doesn’t like to stay in an apartment because of its limited space. When we desire to have a spacious house we need to have a huge amount of money for it costs a lot to own a large house. But the good news is that it is now possible for you to experience the necessary areas that you long for a residential house in an apartment. 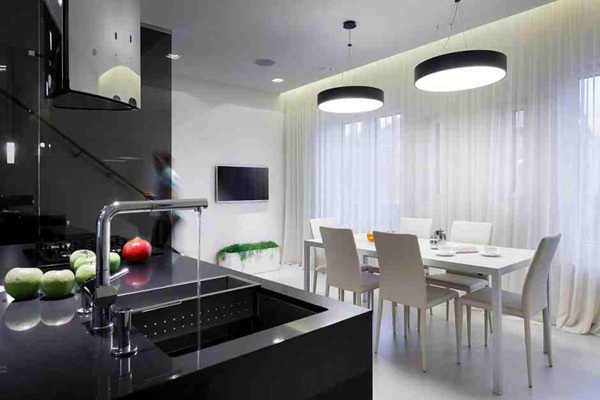 The renovation of an apartment in Saint Petersburg, Russia and this apartment is called as the NNS Apartment. 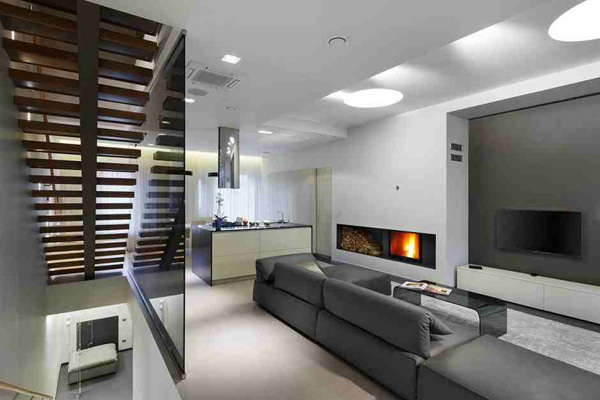 This apartment has three levels and it was made capital reconstruction. 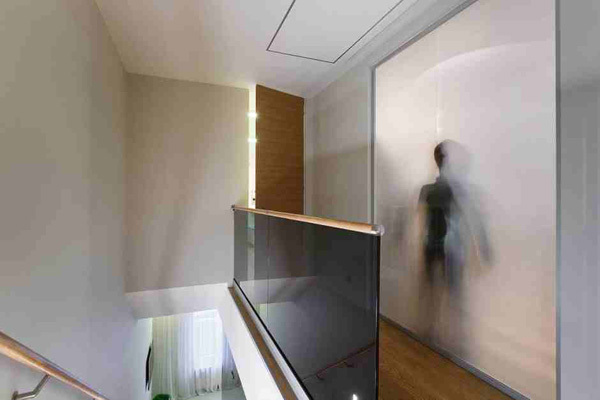 The main transformation of the staircase created a new structure of interior and relationship between different parts. Moreover, the balconies were made possible to create common space on one floor that includes the living room, the kitchen and the dining room. Scroll down the page to see more of the different areas of the apartment through the images below. 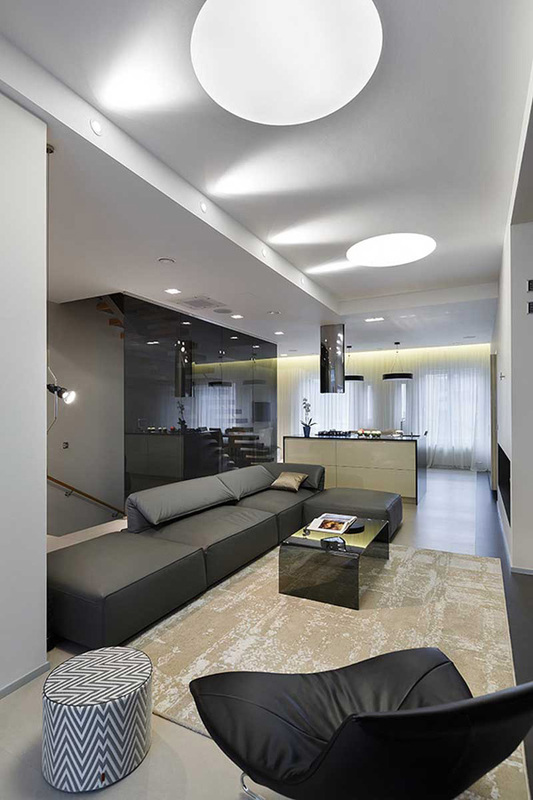 A combination of grey, white and beige color is what this living space illustrate its contemporary concept. Glass material and the LED lights installed in the interior underline its elegance and luxury. 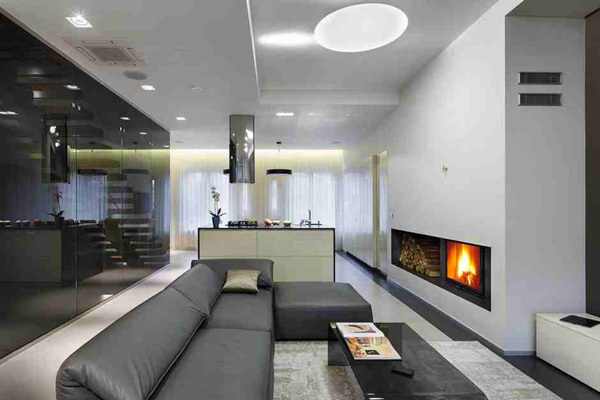 A fireplace is also set in the living space to maintain comfort and the warm temperature. Let us carefully see the qualities of the furniture as well as the other accessories that reveal its durability and charm. 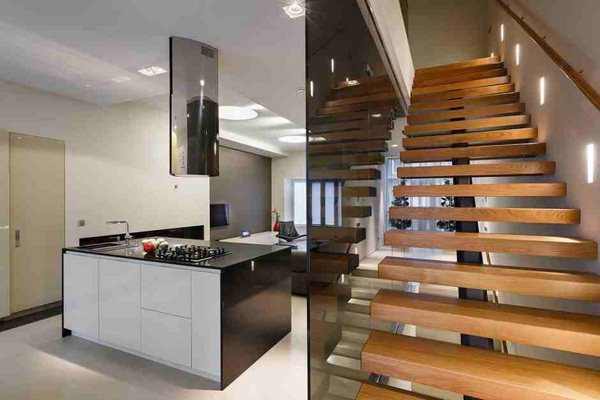 The wooden staircase framed with this glass material is effective in showing its contemporary design and theme. 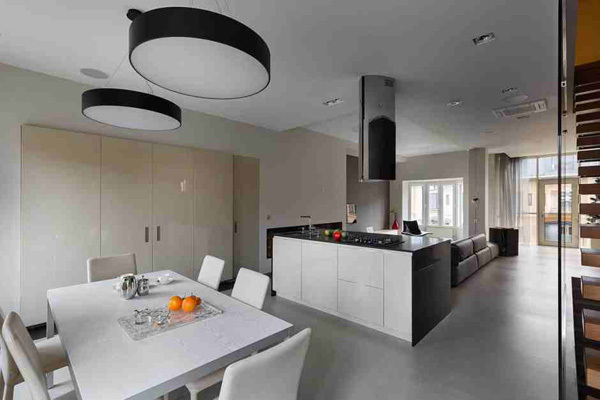 Volumes and geometrical forms of the furniture are well explained in the kitchen and living space. 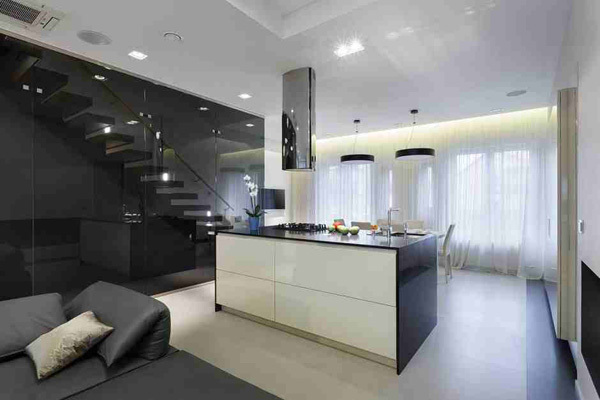 Black and white themed color can effectively show its classy and sophisticated look. 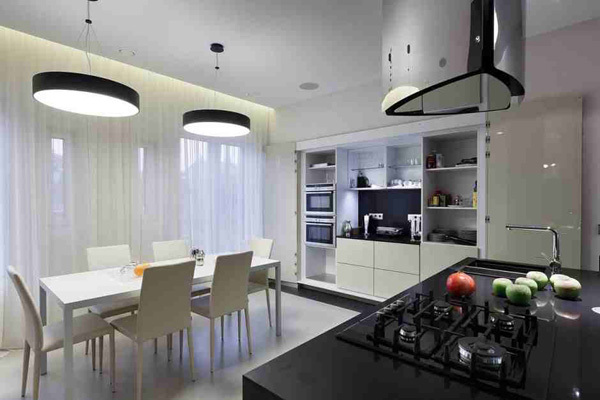 Trendy and latest fixtures and furniture are utilized in the kitchen and dining space to emphasize its modern concept. Exceptional design of the chandelier enhances the mood and character in the kitchen and dining space. Colorful and spacious area uncovers the furniture and accessories set in this bedroom. Glass and wooden material were also used in the different areas found in the second level of the house. 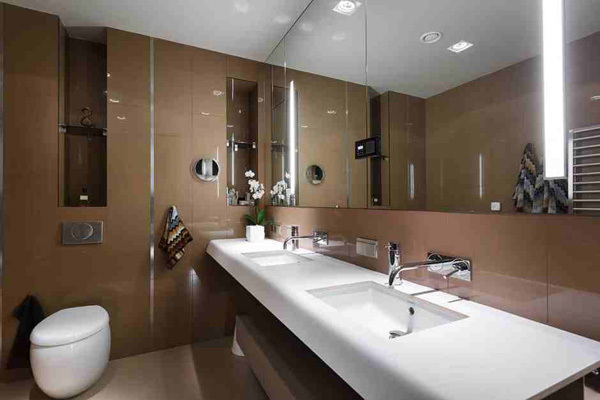 Chocolate brown and beige were efficiently used in the bathroom that also adds elegance and contemporary design. See how this white sink improves the look of this powder area in this bathroom. 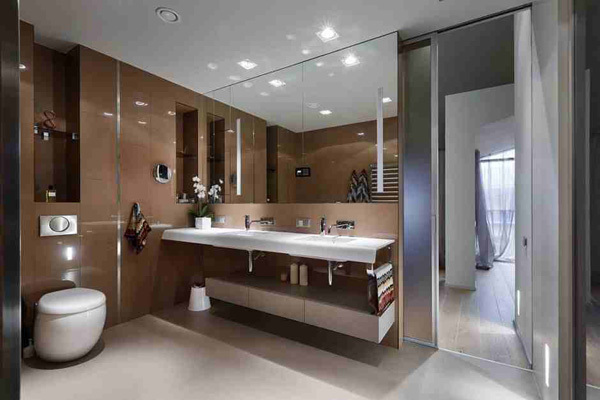 Huge mirrors and chocolate tiles used in this brown bathroom can effectively present a modern look bathroom. Green accent tiles complements with the white and wooden brown furniture and fixtures in this bathroom. The additional space is 24 square meters which is 15% of initial planning. The main reasons of reconstruction of residential space were implemented such as the separation of functional areas on the different levels, the open central space which is located on the first floor, the orientation of central space, the sustainable light in all the rooms and the basic engineering system in the house. 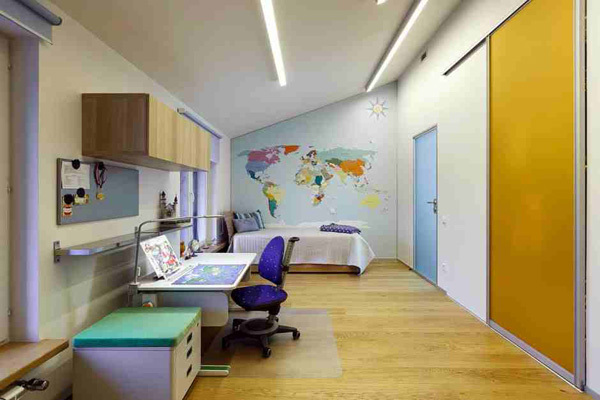 As a whole the Mudrogelenko successfully reconstructed the old apartment in a more contemporary design. 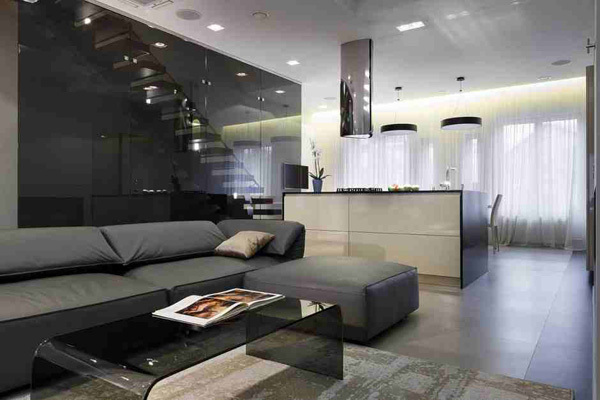 Hope that you have found some helpful ideas to make your apartment more functional and spacious as well.